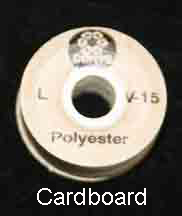 There are many kinds of bobbins available to us for embroidery, but and there is no single answer to the best bobbin type for every embroiderer or every machine. Bobbins also come in colors. Colored bobbins are nice for aesthetic purposes. For example you may want your bobbin thread to match your top thread on items like afghans or baby blankets where the reverse side is likely to show at times. Regardless what kind of bobbin shell you use, the most important characteristic of your bobbin is the type of thread that is on it. 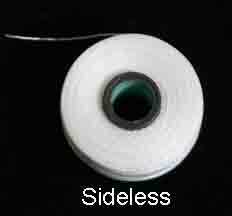 My favorite type of bobbin is spun polyester. 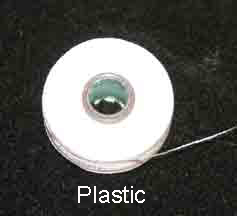 Some prefer the continuous filament polyester, which is thinner and smoother. 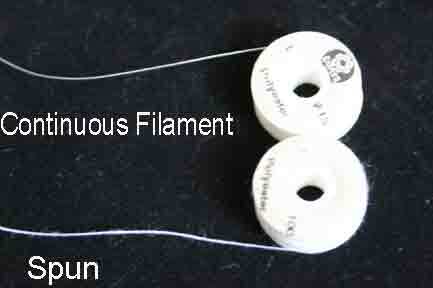 In my opinion, this thinner, smoother thread is more difficult to control in the bobbin case, making it more difficult to get consistent tension. I like the texture of the spun polyester, because it gives a wide range of adjustability. 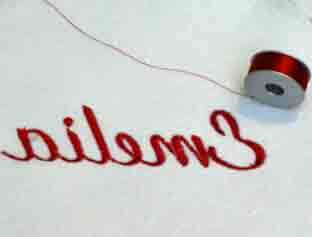 It stitches with similar tension as a friendly cotton bobbin thread, but without the lint associated with cotton. Check out the difference in their appearance here.